View the threads Wvdaisy has started. Leave feedback for Wvdaisy or read feedback left by other members. View the member feedback Wvdaisy has written of others. "My husband and I live on 10 acres near the small town of Buffalo, WV. My current obsessions, besides my flower and water gardens, are my Holland Lop & Dwarf Hotot rabbits, toy poodle girls and Anatolian Shepherd rescue. I volunteer with the National Anatolian Shepherd Rescue Network www.nasrn.com and Carolina Poodle Rescue www.carolinapoodlerescue.com. I also do volunteer work for the WV National Guard Family Programs mostly working with the children who have family members in the Guard." 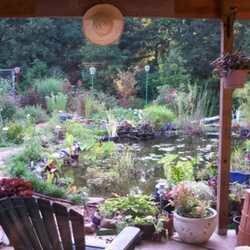 "Our water garden and surrounding landscape. Lots of work to do yet."